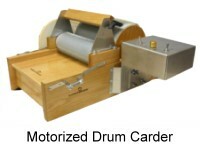 High Quality Built Drum Carders Hand Made In the U.S.! We have the widest selection of drum carders and the lowest prices in the world and we offer FREE SHIPPING in the U.S. on all of our products. 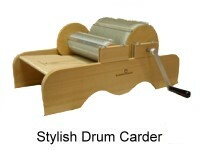 We use highest quality carding cloth on all of our drum carders and blending boards. We manufacture everything in the USA. We ship all orders out usually within a day but for some orders can take up to 3 days. We have many happy, satisfied customers and we are confident you will be too. You have the option to buy the carder itself, each individual accessory or you can buy our kits that include all accessories. 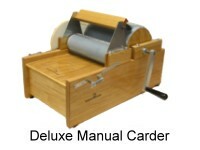 All our manual crank carders have a 5 to 1 carding ratio and are belt driven. All our manual crank carders have a 5 to 1 carding ratio and are belt driven. Our Baby 4" wide that produces a 5"x22" batt to our extra wide large motorized that produces a huge 18"x39" batt. We give you the option to choose from 5 different cloth types to suit your carding needs. We also offer two different Blending board models. 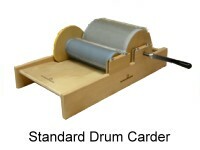 We use highest quality carding cloth on all of our drum carders and blending boards. We manufacture everything in the USA. We ship all orders out usually within a day but for some orders can take up to 3 days. We have many happy, satisfied customers and we are confident you will be too. You have the option to buy the carder itself, each individual accessory or you can buy our kits that include all accessories. All our manual crank carders have a 5 to 1 carding ratio and are belt driven. 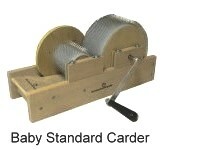 Our Baby standard and Baby deluxe are 4" wide carders that only come in 72tpi cloth that is specially designed for a variety of fibers, perfect for the the one with a small budget yet wants versatility and a compact drum carder. Our standard model is also affordable yet offers a full size 8"x22" batt and has the options of adding our whole line of accessories. The Deluxe model produces a 8"x22" batt and comes with brush attachment, clamp and doffer for picking batts and has the option of adding a motor in the future. Our "Little Brother" small motorized is a popular seller. It is small enough to carry around and offers a hands free operation with a 5 to 1 carding ratio. It produces a 8"x22" batt. Our large motorized "Big Brother" produces a 8"x39" batt and has two motors for a infinite carding ratio and does not have any belts on the machine. The extra wide "Big Brother" large motorized carder produces a huge 18"x39" batt and has a extra powerful motor on the large drum that can easily handle any big carding job. We offer additional drums that are easily swapped out with a screwdriver. All our deluxe and motorized models are built of finished solid oak and come with a slide out tray under the large drum that catches all and any debris. 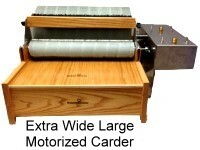 We also can replace carding cloth and repair hand carders and drum carders. 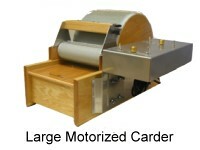 See our Carder Repair page. 30 DAY RISK FREE! If you are not satisfied with your carder simply return it for a refund minus all shipping costs. 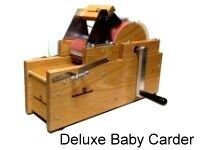 Also we offer a limited lifetime warranty on the construction of your carder to the original owner.